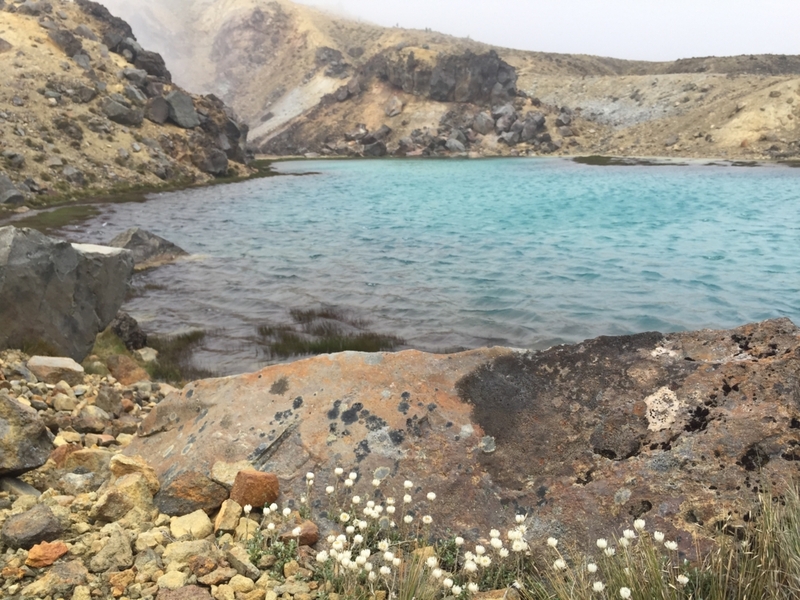 Tongariro National Park is New Zealand's oldest national park and is the first in the world to be designated as a UNESCO dual world heritage site, which means this place has great significance both naturally and culturally. 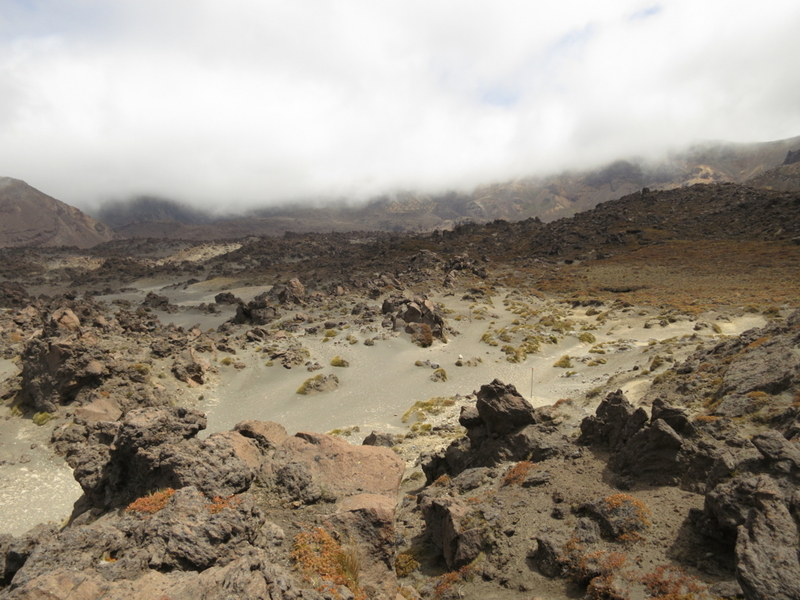 This area is known for its moon-like landscape, which was created by volcanic activity and erosion by glaciers. 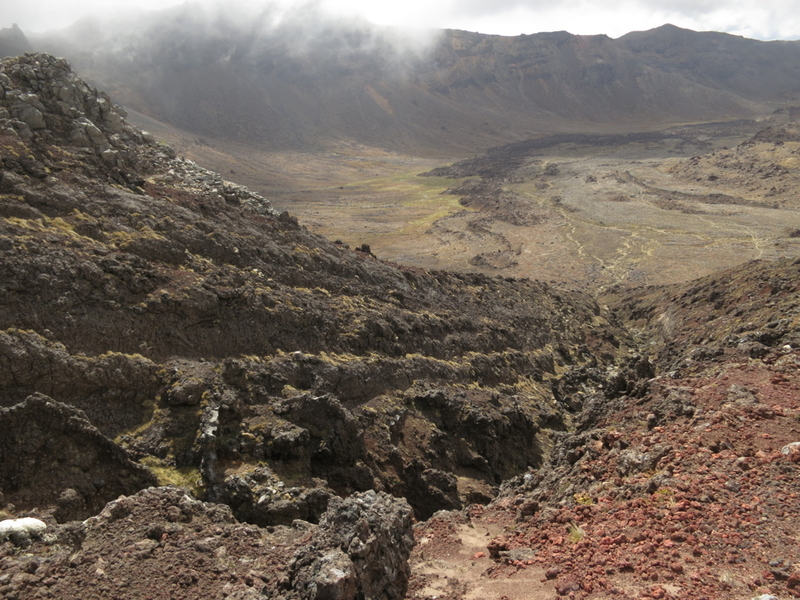 The track I walked is the Tongariro Northern Circuit. 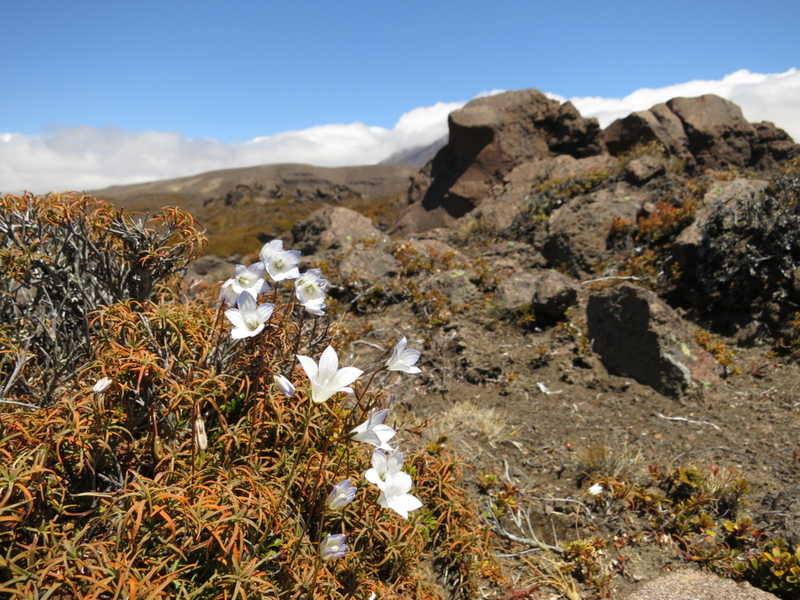 This route makes a loop around three famous volcanoes – Mt. 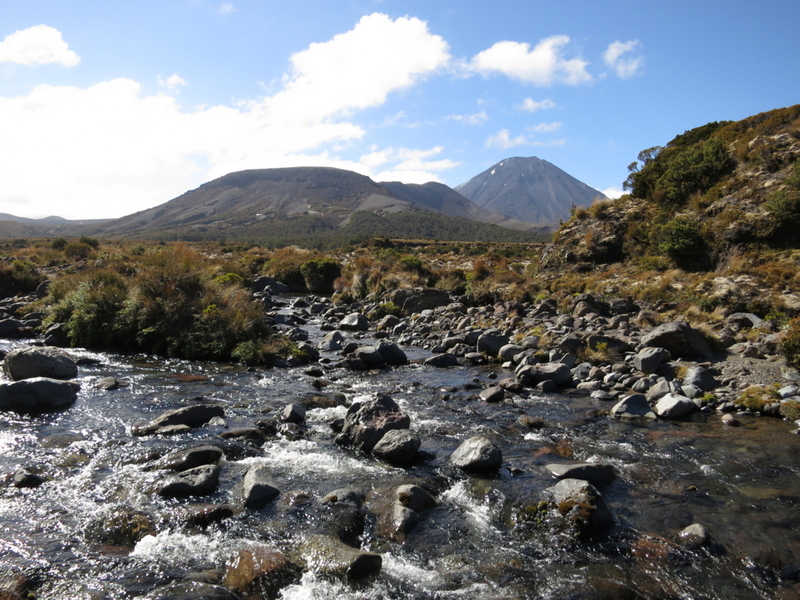 Ruapehu, Mt Nagauruhoe and Mt. 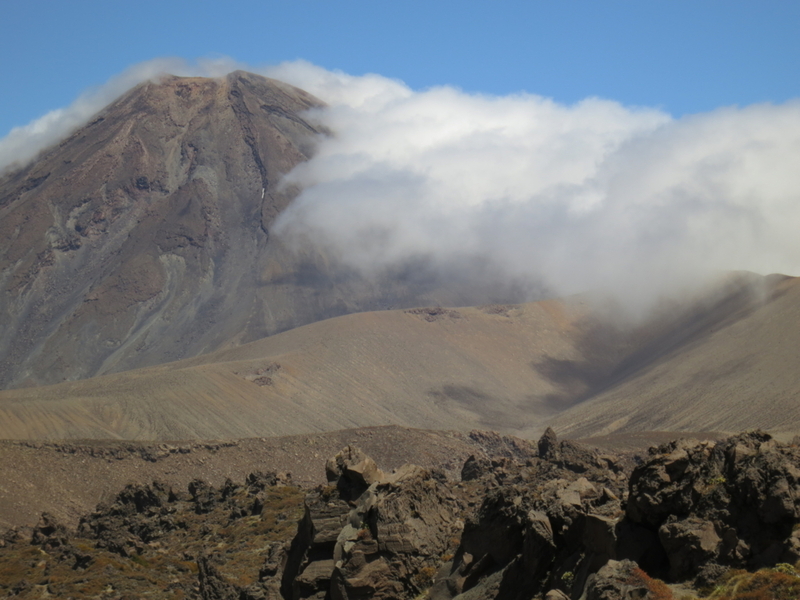 Tongariro – and is listed as one of the seven Great Walks in NZ. It's indeed regrettable that I couldn't climb Mt. Nagauruhoe and Mt. Tongariro because of the terrible weather on the second day, but the vast expanse of rugged terrain was truly amazing, and it was well worth the visit. 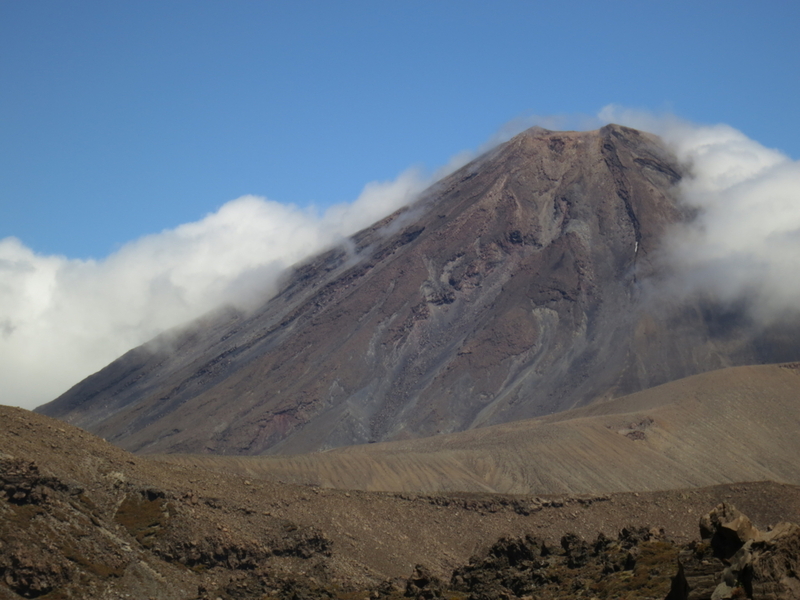 I took a train to Tongariro National Park from Auckland. 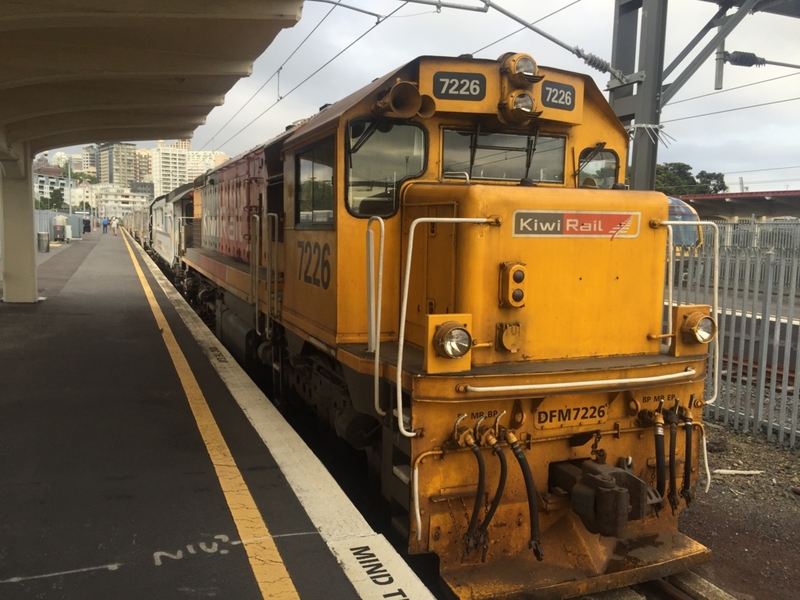 Train fares are so expensive in NZ. It cost me 90 NZ$ to buy the ticket online. 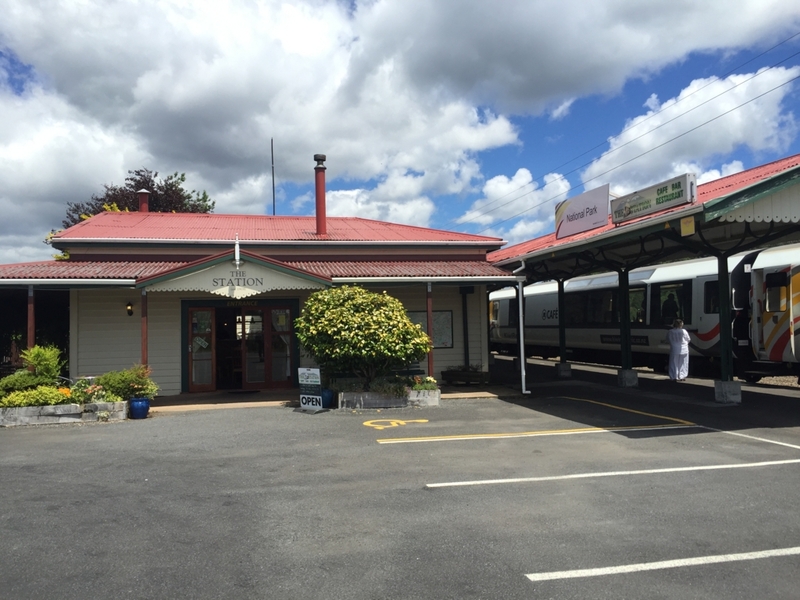 That said, since it is the only public transportation that goes directly to Tongariro, and because I personally like to travel by rail, I accepted it. I could see an endless expanse of meadows through the train window. 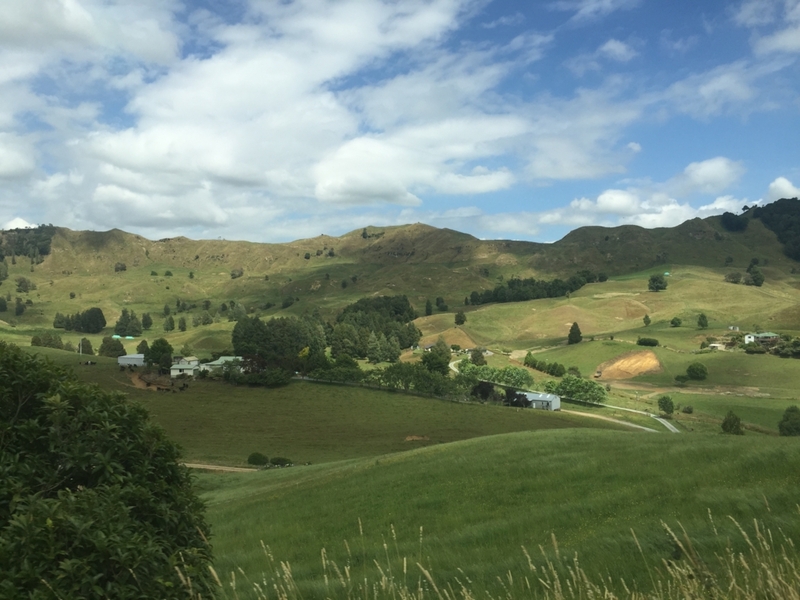 Rail lines in NZ are not congested by trains, but for some reason, my train arrived at National Park Station an hour later than scheduled. 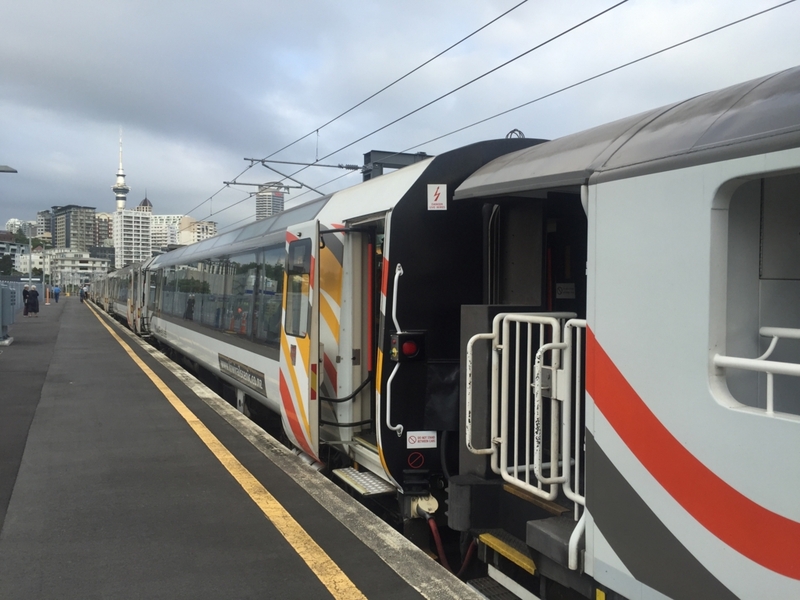 I think Kiwi Rail has become a sightseeing tool rather than a means of transportation. It seems passengers don't care so much even if their train is late. Sitting in a comfortable seat, drinking coffee and sometimes going to the observation car to see the scenery, it looks like they are enjoying the journey by rail itself and moving to the destination comes second. National Park Station reminded me of the former Aso Station in Japan. 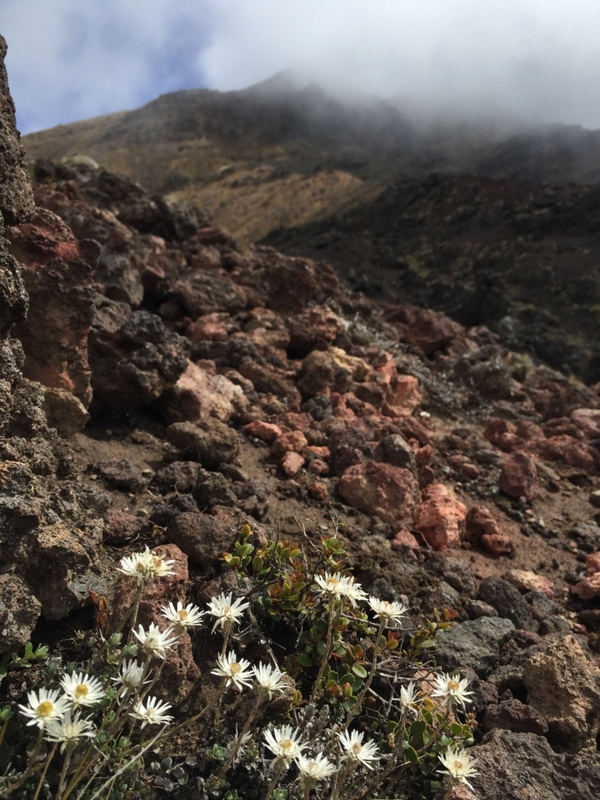 Aso is also a volcanic area and has the largest crater in the world. Believe it or not, there are railways and towns inside the Aso crater, and a lot of people have been making a living there. Aso Station went through renovation in 2011, and has changed into a stately black building, but when I visited there with one of my friends during a trip to Kyushu region by rail, it still was a small and cute white building that showed some influence from Western-style architecture. I was still a high school student back then, and I cannot help missing those days. 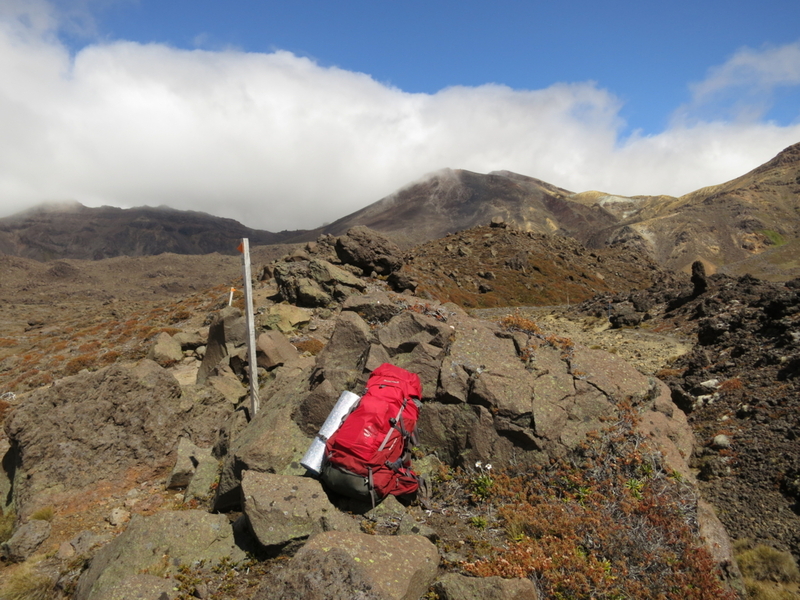 After getting off the train, since there was no means of transportation, I tried hitchhiking from the station to Whakapapa Village, the starting point of the hike. 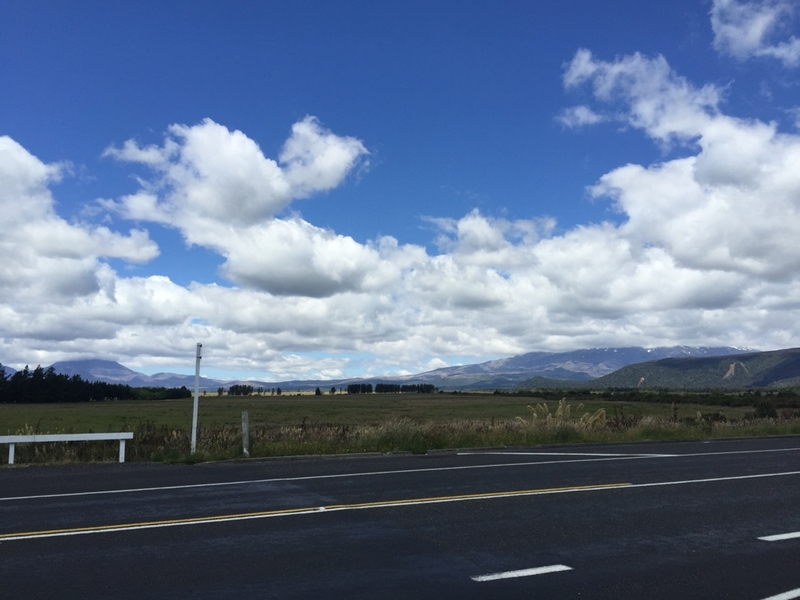 I was extremely nervous because it was my first time to hitchhike in my life, and I couldn't pluck up the courage to stick out my thumb for a long time. I took a deep breath, gathered up all my courage and made the sign, but, unfortunately, 10 or more cars just passed by and I felt really miserable. Before I knew it, 30 minutes had passed since I started to try. I felt helpless and was about to cry. At that moment, a woman traveler walked up to me, and because our destination happened to be the same, we decided to try hitchhiking together. It's encouraging to have a companion. 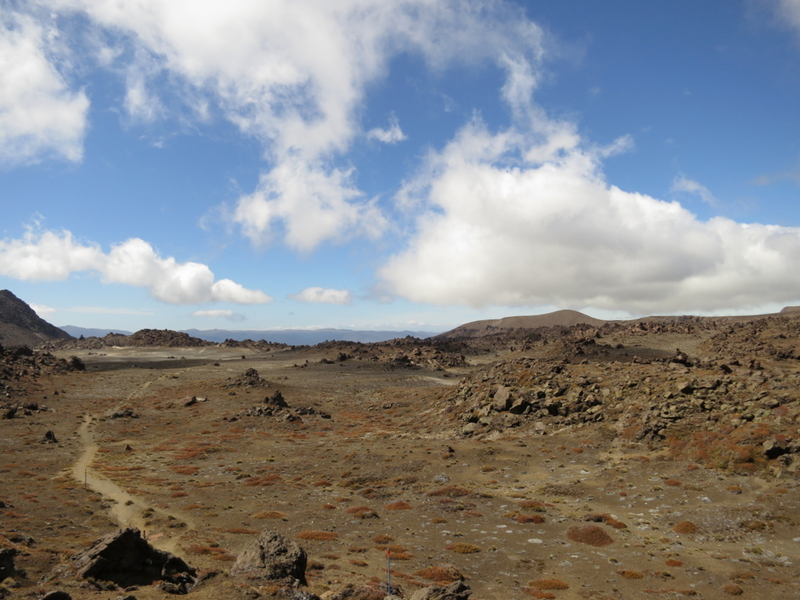 After a while, we succeeded and got a ride to the Whakapapa Village DOC visitor center. Thank you so much, driver!! I cooked noodles as breakfast & lunch (surprisingly I hadn’t eaten anything until 4:00 pm that day), left some unnecessary luggage at the visitor center, and started walking. I started walking at around 5:00 pm. 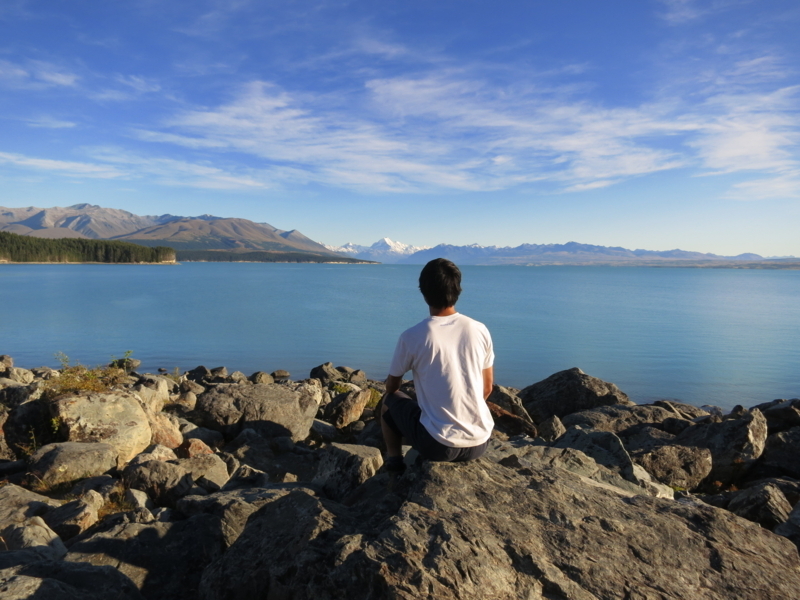 It’s difficult to imagine departing that late in Japan, but since New Zealand has a long daytime in summer (they have summertime!! ), the sun does not set until 9:00 pm, so I still had enough time left to walk. 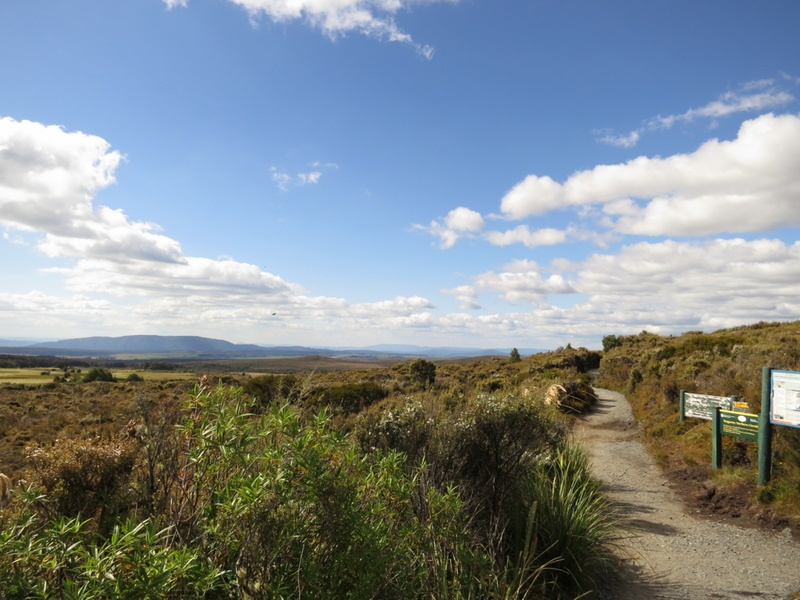 I walked along a well-maintained track, although sometimes it was a little damp, through shrubland to a campsite near the Mangadepopo Hut. 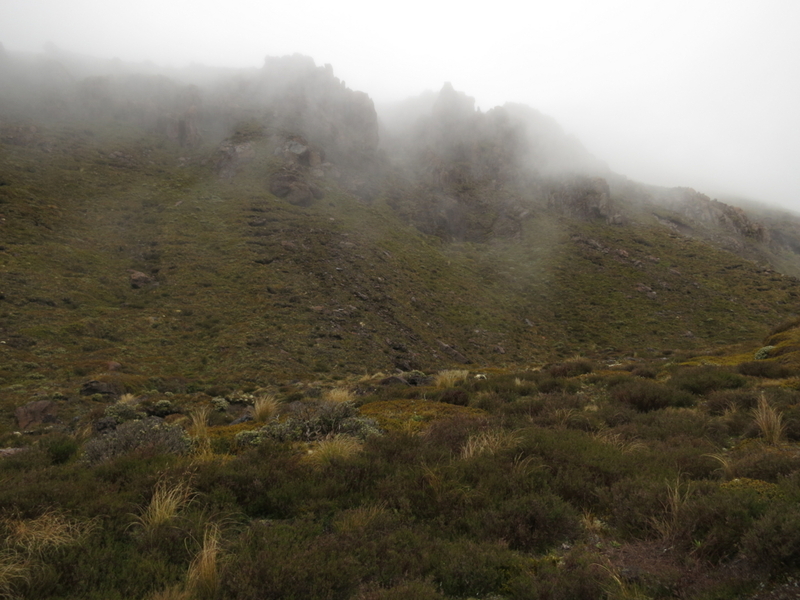 Just before reaching Mangatepopo Hut, I pushed through the bush to the foot of Mt. Pukeonake, laid out a mattress and slept there. 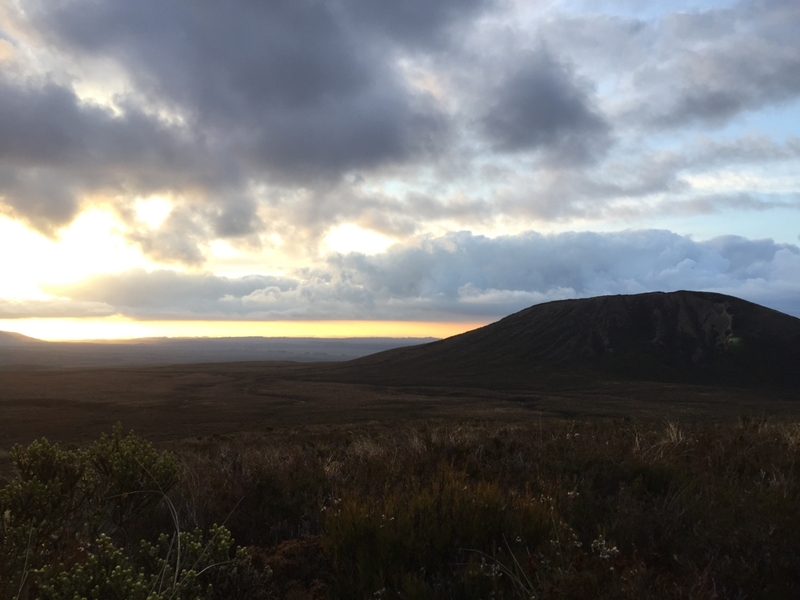 According to DOC, camping is not permitted within 500m of any track except at designated campsites. However, I thought this rule can also be interpreted as "You can enjoy camping freely only if you are more than 500m away from any of the track," so I put it into practice. Later, I thought I was too ridiculous to think this way. 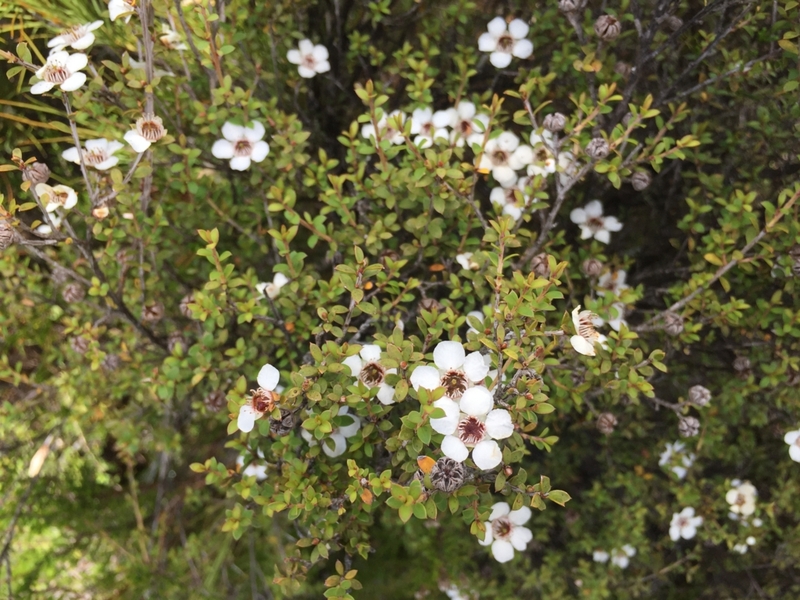 Taking it into consideration that the original objective of the rule is to protect the fragile vegetation and soil, I admit it doesn't make sense to trample them under foot for about 500m, even if literally speaking there's nothing wrong. I was born and brought up in Japan, so I cannot go without Asian food. 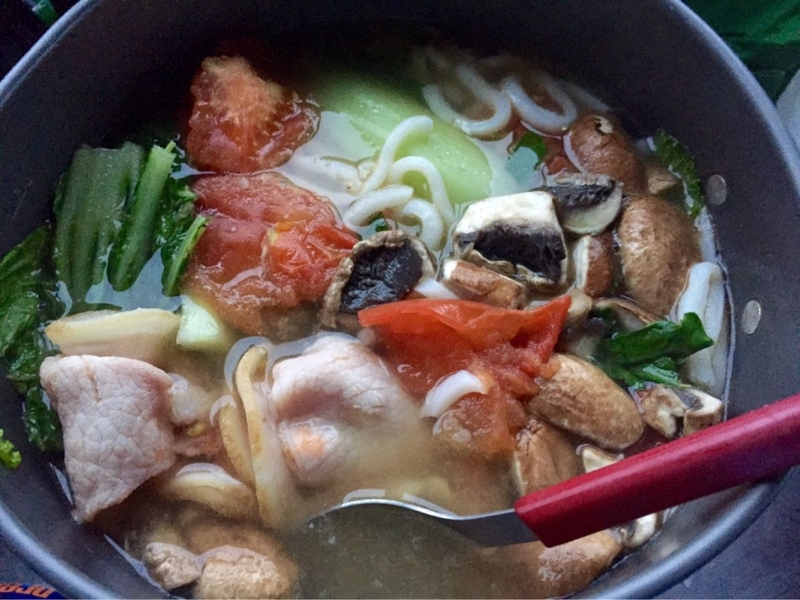 I found Japanese udon noodles sold at Countdown, a major supermarket chain in NZ, and bought a lot to eat up in the mountain. They are easy to cook and nutritious. I have only to boil them together with vegetables, mushrooms and bacon. Before the sun set, I read a novel "And Then (Sorekara)" written by Natsume Soseki. The words that Daisuke, a central character of this book, told his old friend, Hiraoka, is really selfish and even disgusting, but I was stunned to find that I have some traits in common with him. First, he attributes the reason he doesn't work to the wrong social structure. Second, he has already given up changing society and wants to stay away from it. And lastly, while he looks down on people who are working as victims swallowed up by society, he himself has to financially rely on them to live – this is contradictory. Of course, I am quite different from Daisuke, too. Daisuke may be satisfied with his life as a drifter, receiving money from his parents, appreciating the arts, and being a speculative thinker. He might have wished that this kind of life would continue forever (although this was applicable to him only before he became so much in love with Michiyo, the wife of his old friend, Hiraoka). On the other hand, I am more positive than him. The point is that I am too worried that I will lose something. Deep down, I want to work, and I hope that my work will have great value in its own right and can be valued by society besides being a way to make a living. Also, I want to have a warm and happy home with a person I love. In short, I am a dreamer and don't want to sacrifice anything, regardless of whether it is work, family life or myself, and just because of that, I cannot move forward. If I join a company or become a public official, I don’t think I can play an important role there because I am not so good at getting along with others. Also, rushed by everyday work, my job may easily become nothing but a way of making money. Long working hours can result in sacrificing family life. In the end, what will be left? I’m afraid working can lead to losing everything important to me. I think the ultimate reason why I took a year off from university was that I was too cowardly to make a decision for the future, and wanted to be told forever "You have infinite possibilities". The weather was awful in the morning. There was little visibility and it was extremely windy. It was hard to walk straight, and small particles of sand were blowing in my face. I escaped behind a rock, put on warm clothes, ate some food, and managed to make it through. I was originally planning to climb Mt. 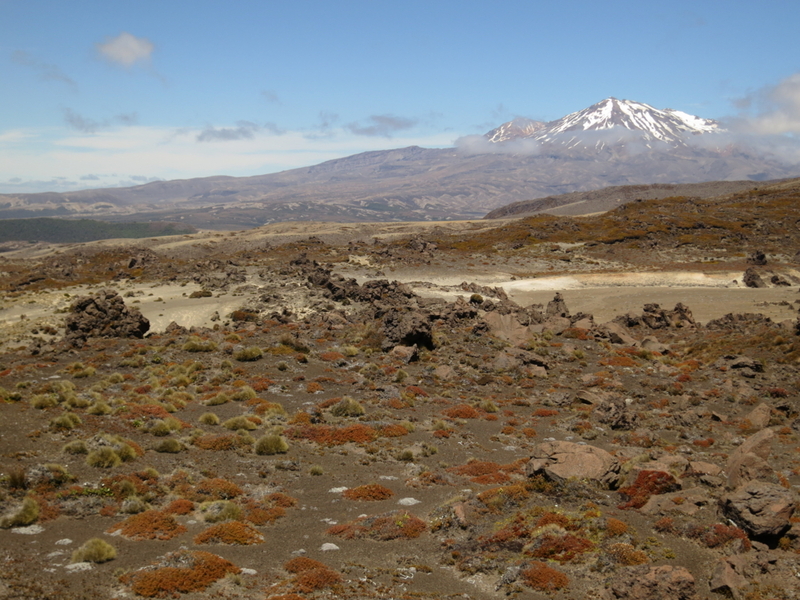 Ngauruhoe and Mt. 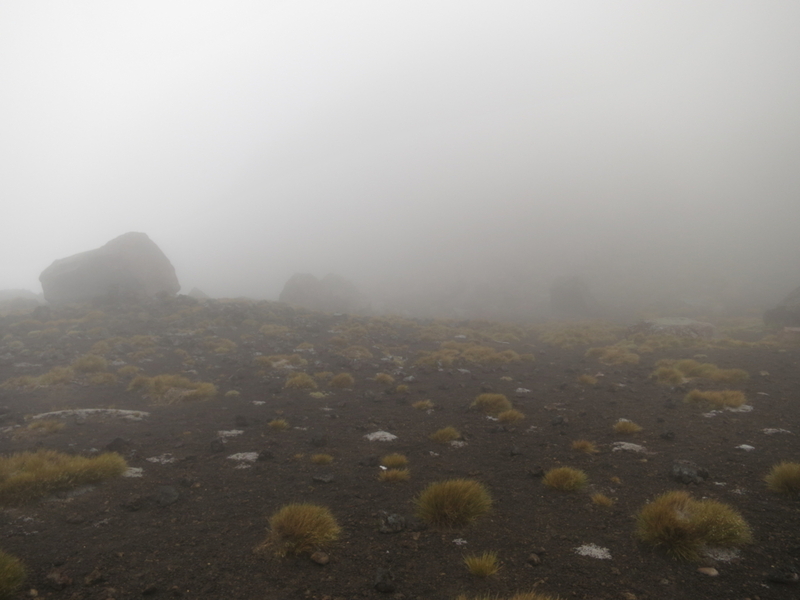 Tongariro, but there was nothing to do but give up those plans under conditions like that. 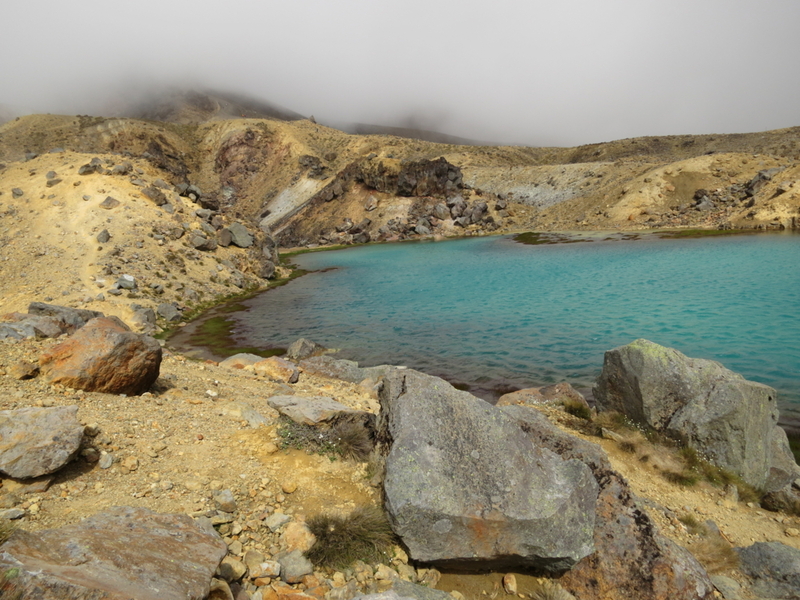 After descending to Emerald Lakes, the visibility improved, although the wind was still strong. The track below the Emerald Lake cuts through vast amount of old lava flow, and it shows us the tremendous energy of the eruption. After a while, Mt. 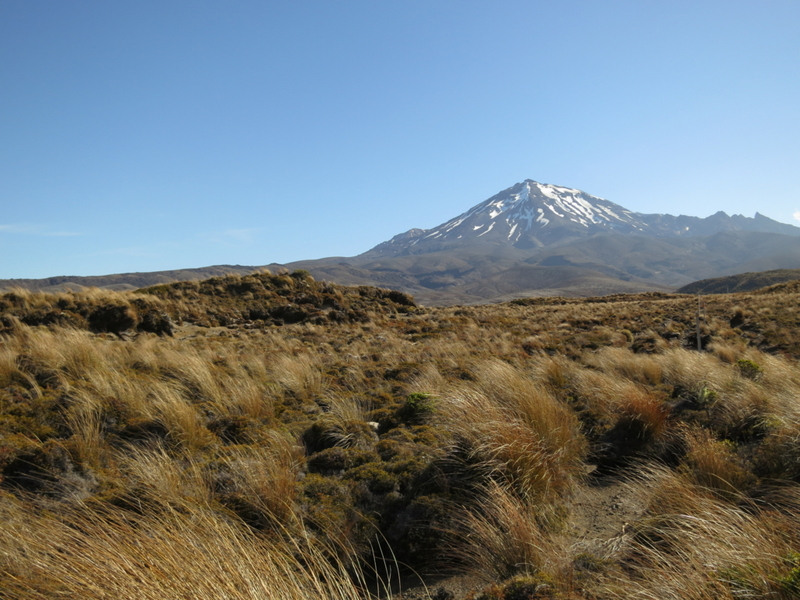 Ruapehu and Mt. Nagauruhoe finally appeared from the cloud. Mt. Nagauruhoe is only 7,000 years old. 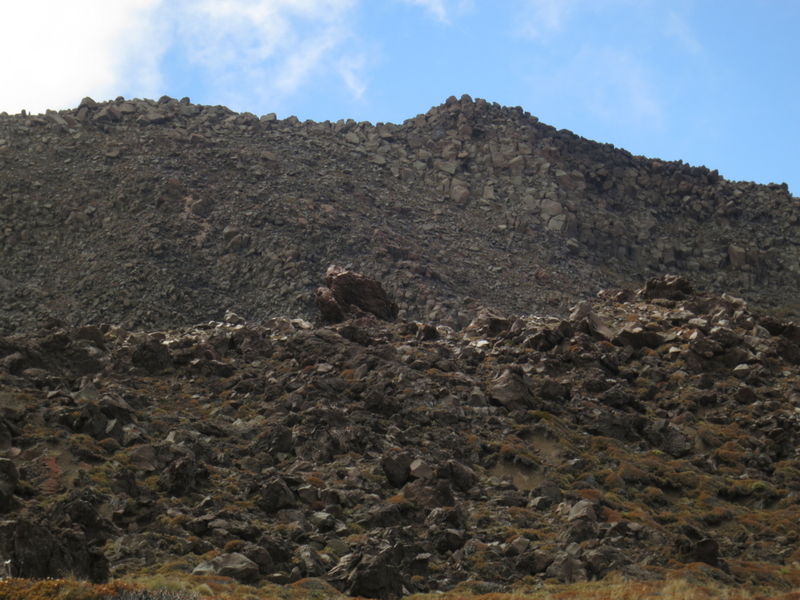 The rugged old lave flow seen in the pictures above came from this mountain when it erupted. Mt. 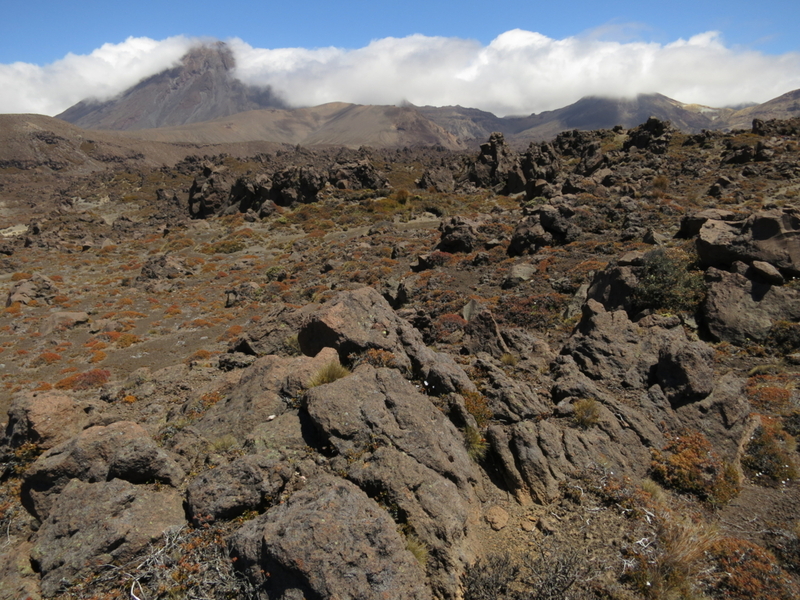 Ruapehu looks like Mt. Chokai in Japan's northeast. Ruapehu still has a lot of snow on top of it. 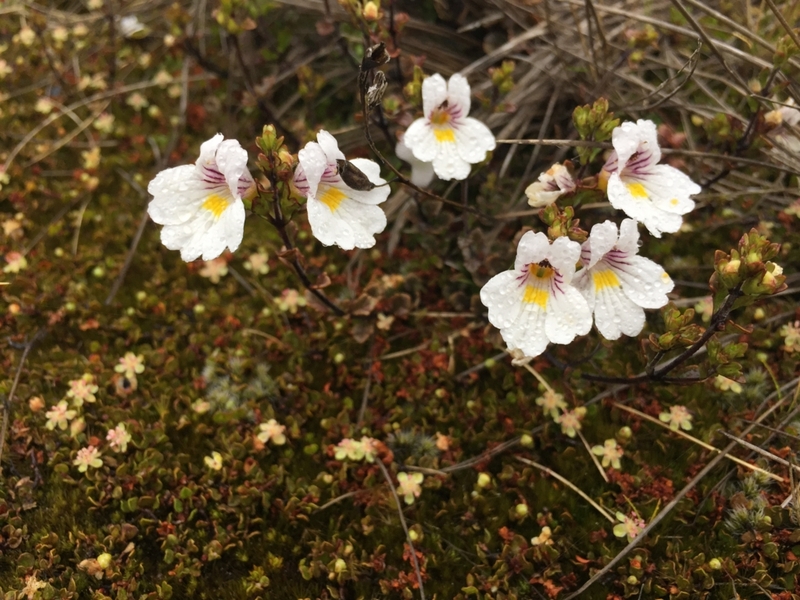 As a Japanese, I cannot help looking for "Yukigata", a Japanese word which means the shapes of snow patches left on the mountain surface. People in the past thought that such shapes look like men, animals, farming tools and so on, and gave a name to conspicuous ones. Farmers in Japan used to have a custom of using Yukigata as an important sign. 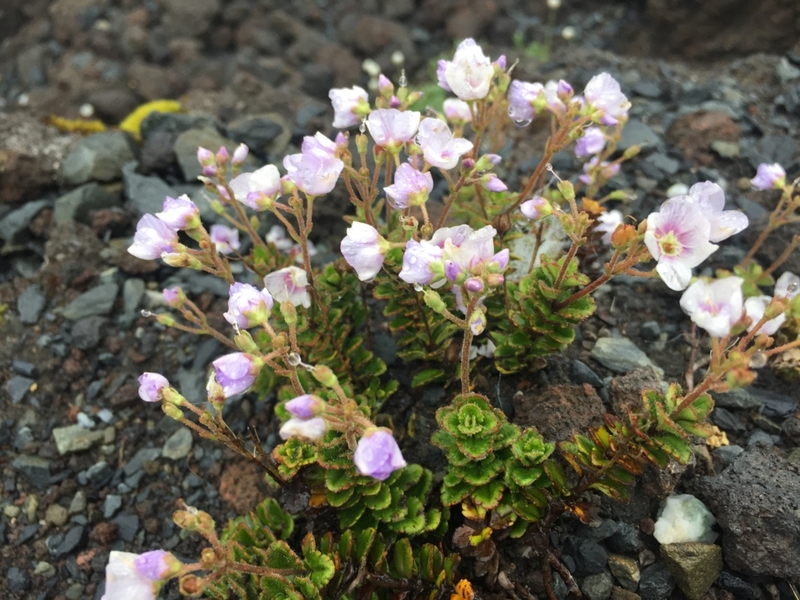 The appearance of Yukigata in spring meant that the time has come to plant rice seed, beans, and so on. After Waihohonu Hut, the track goes along Waihohonu stream. 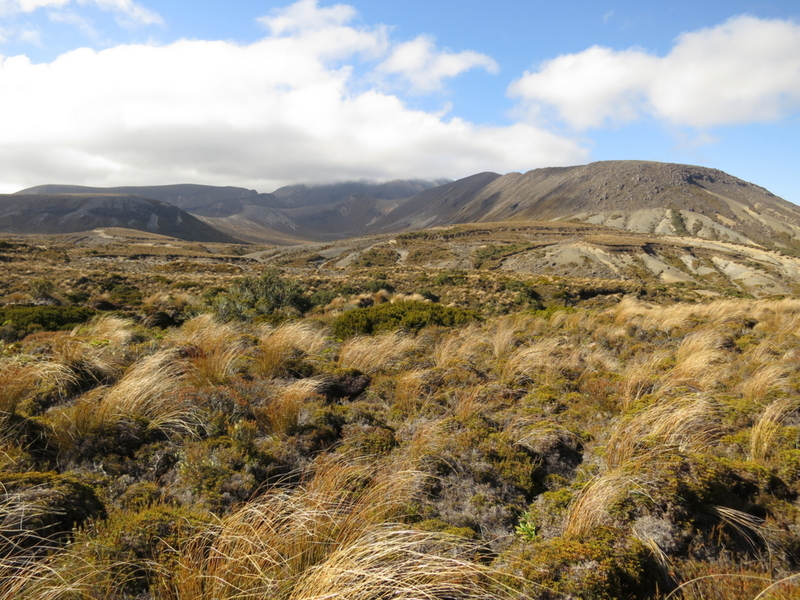 Barren landscape and small moraine hills along Waihohonu stream are the testimony that glacier once covered the area. 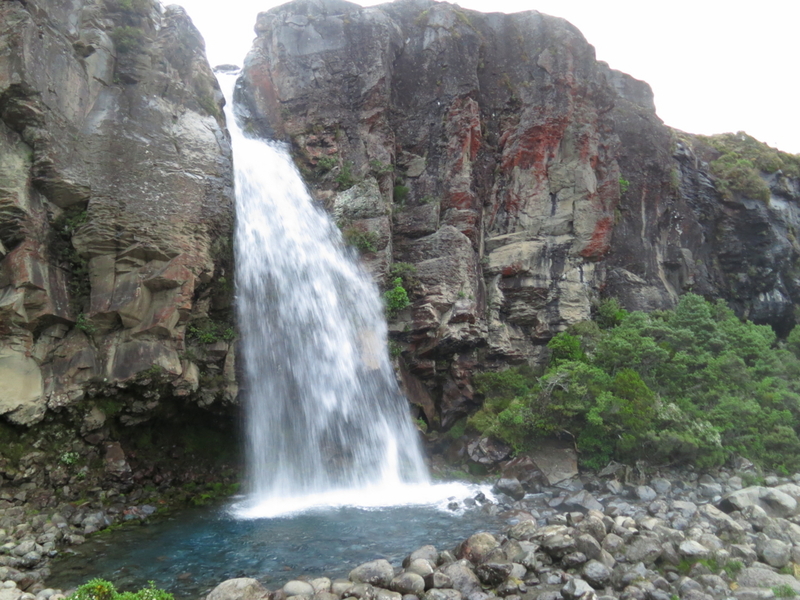 I walked for a long, long time on that day, and arrived at Taranaki Fall at 8:00 in the evening (it still was not dark, though). 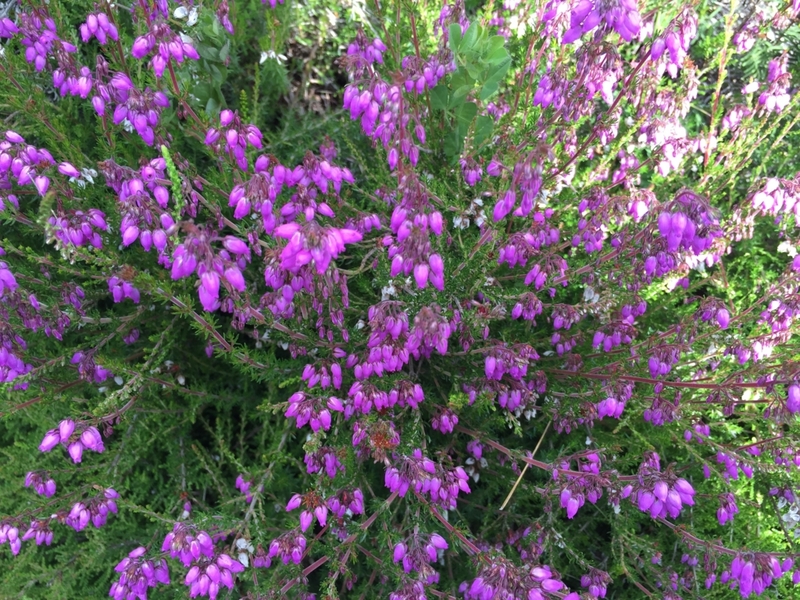 I saw an old man with luxuriant beard there, putting up a tent and drinking coffee. As I mentioned above, camping is not allowed here, but when I thought of what I did the day before, I felt I was not qualified to warn him. I thought I must have morals afterwards so that I can warn someone who is doing a wrong thing without hesitation. 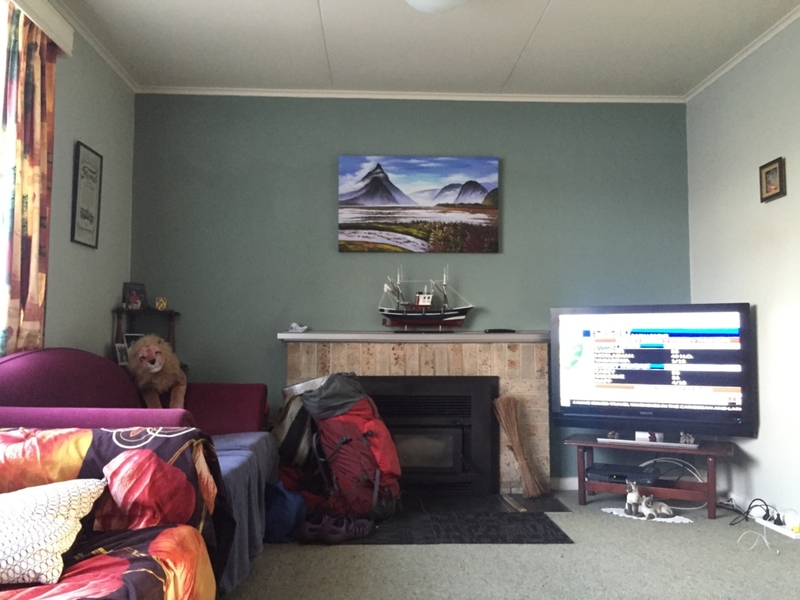 It was after 9:00 pm that I came back to Whakapapa Village. 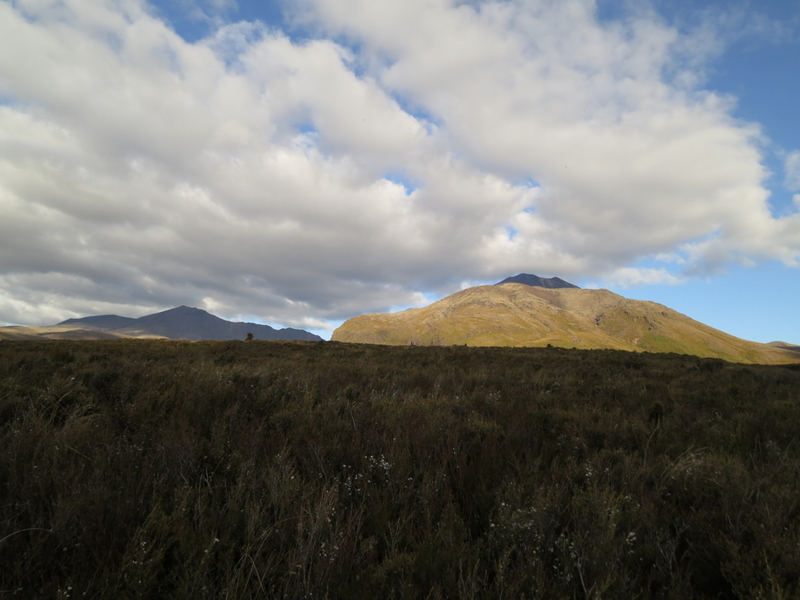 The sky was already dark, and I found that I had walked over 15 hours that day. When I got back to the DOC visitor center and was cooking udon noodles just like the previous day, a DOC staff came out and asked, "Are you going to sleep here?" I felt a little nervous but said "Yes, I would like to sleep here". He said OK with a bitter smile on his face. 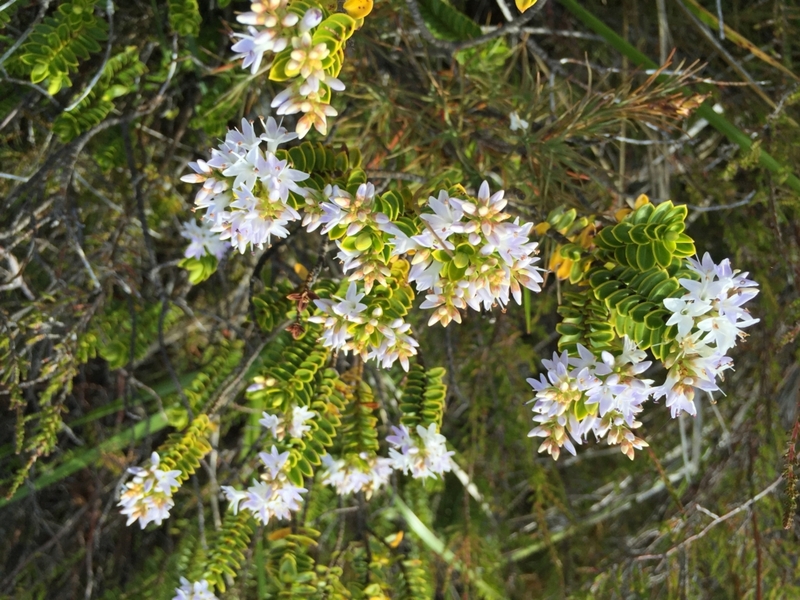 I felt really warm because I could see he understood my situation, and also tolerant enough to let me do as I like. 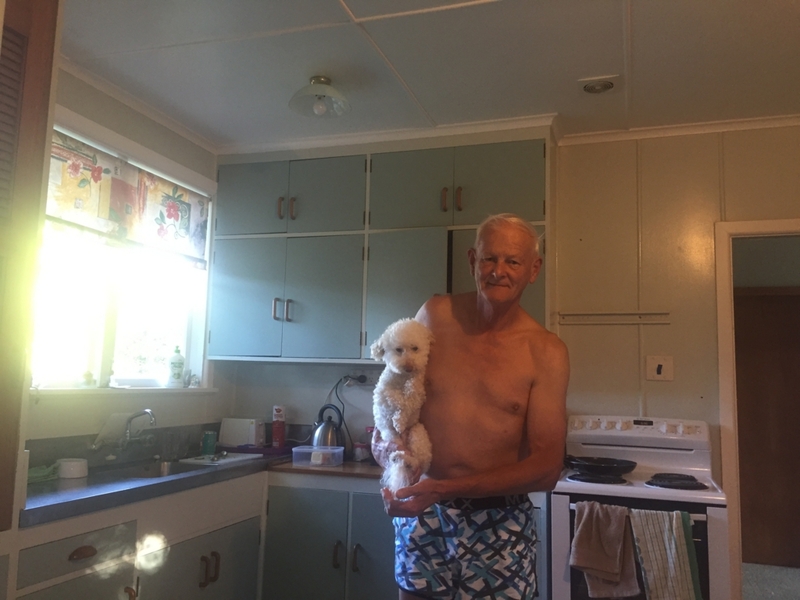 I had a really good sleep there, and the next day, started to hitchhike again heading to my next destination, Taranaki. Thank you so much, Michel, for offering me a ride and letting me stay at your home. I will never forget about your kindness. You helped me wash clothes, prepare breakfast and shared interesting stories in your life with me. Although it was only a short period, I had a really good time with you.